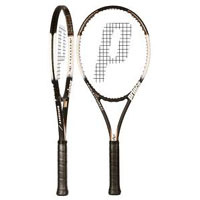 At a medium power level, the Prince Triple Threat Bandit Over tennis racquet, made of titanium, offers impressive power. The enlarged sweetspot makes it easier to get the best shot each time, and it gives the racquet an overall satisfying feel in the hand. We were also impressed by the high accuracy this racquet affords, in the right hands. While on the pricier side, it’s a wise investment and solid overall choice for the intermediate to advanced player.